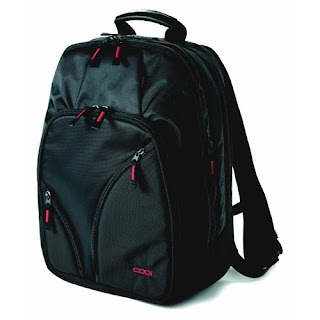 This is a CODi CT3 Tri-Pak backpack, which is designed to eliminate hassle while navigating airport security. The CT3 Tri-Pak features two distinct compartments hinged by military grade ballistic nylon, allowing the case to lie flat while passing through airport x-ray machines, eliminating the need to remove the laptop from the case. A front compartment contains a business organizer with pockets for pens, business cards and other essentials. Travelers can simply grab the case from the conveyer with one hand and go—the case secures itself with Velcro between the compartments. Two zippered outside pockets are perfect for easy access. Two side mesh pockets are great for water bottles. CODi has been meeting the mobile computing needs of the corporate marketplace for over a decade. They are proud to count more than 200 of the Fortune 500 as clientele. With twin factories in the U.S.A. and global partnerships to complement our product assortment, CODi offers many unique capabilities that our competitors simply cannot match. CODi's 12+ years of acquired knowledge permit them to genuinely partner with their customers and to address their mobile needs with precision. The value shows up in significant cost savings people can realize by partnering with CODi.